St Peter’s Church glowed with festivity as the Mayor of Seaford’s Carol Service took place on the crisp and wintery evening of 14th December. The Mayor, Councillor Lindsay Freeman, and her consort, fellow Councillor and husband, Nick Freeman, welcomed many guests including local dignitaries, local residents and local businesses, organisations and charities. The service was opened by the Rector, Reverend Canon Dr Andrew Mayes, with a warm welcome message and opening prayers. Readings were made by Peter White, Seaford’s Town Crier; Councillor Mark Brown, Deputy Mayor of Seaford; Kelly-Marie Blundell; Jessica Batchelor, Young Mayor of Seaford; the Mayor herself, Councillor Lindsay Freeman. The readings were taken from both the Bible and Quran, reflecting the Mayor’s experiences in Jordan and her interest in the culture, faiths and teachings. The church and audience were filled with Christmas spirit as St Peter’s Church Choir and Seaford Primary School Chamber Choir sang carols by the candlelight. Mayor Freeman gave an address to the gathering; thanking those in attendance and those that have supported her during her time as Mayor. She acknowledged the crises in the world, in particularly the Middle East, and closer to home, the struggles being faced in Seaford such as with the rail service, balancing this by touching on the positives and projects that will be seen coming to fruition in the New Year. The service closed with further carols, prayers and blessings, before a retiring collection for the Mayor’s two chosen charities; Waifs & Strays Dog Rescue and the RNLI. Through the collection and the raffle during post-refreshments, over £230 was raised for the charities and will go towards the vital services provided by the charities. 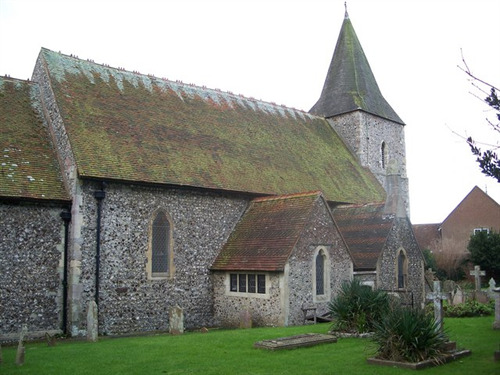 Pictures: St Peter’s Church, Seaford; Mayor Freeman giving her address; Town Crier, Peter White, leading the dignitaries. Speaking about the service, Mayor Freeman says ‘Father Andrew was so much help in planning my Carol Service and between us I think we did well. I really enjoyed planning it and taking part and many many thanks to all who came and helped to raise £233 for my charities the RNLI and Waifs and Strays. I hope we see an end to the conflicts in the world and refugees will be able to forge new lives. I would like to wish everyone a Merry Christmas and a Happy New Year and as John Lennon said "Give Peace a chance"’. 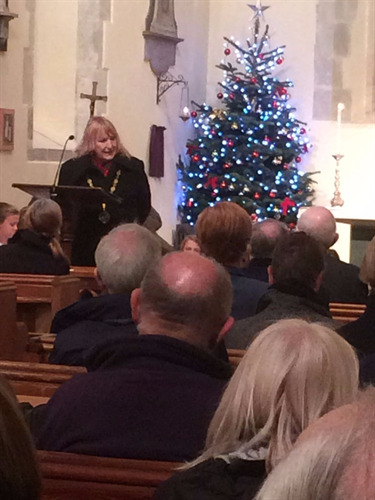 Pictures: St Peter’s Church, Seaford; Mayor Freeman giving her address.